Ezra’s first daycare was a parent run co-op. In addition to administrative duties, each family helped provide care to a dozen kids, ages 6 months to 4 years. I worked ten hours a week at the daycare for 2 ½ years, and spent many of those hours reading to the children in a group and one-on-one. I always enjoyed watching a child fall in love with a favorite book. He or she would come across a specific book that captured his or her curiosity, and we would spend the next month or two reading that same title over and over. Then, a new favorite book would suddenly replace the old. Each selection was a wonderful glimpse into the child’s developing personality and emerging interests. My time at the co-op was also a great opportunity for me to learn what types of books attracted different types of kids. The one book that almost every child became fascinated with as they approached the age of four was the Usborne Flip Flap Body Book. Ezra was no longer at the co-op when he reached this age. So, I knew he would not have the opportunity to share the dog-eared copy I had read so many times to his friends, but I couldn’t forget how important this book was to the children at that age. So, I purchased a copy of the book at a used bookstore anticipating Ezra’s impending obsession with the human body. 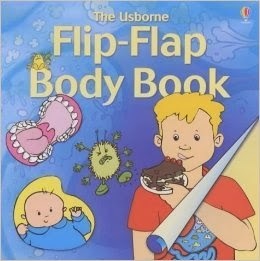 Ezra was drawn to The Usborne Flip Flap Body Book right on schedule. The book is divided into three sections. The first introduces the parts of the digestion system. The second explains the five senses, and the last focuses on pregnancy and fetal development. Ezra, like his peers, only took a cursory interest in the section dealing with the senses, but he is enthralled with the first and last sections. The Usborne book provided a wonderful introduction, and encouraged us to find books with even more information about digestion and reproduction. Our search led us to our library where we discovered The Quest to Digest by Mary Corcoran, a fun and fact filled book on preschoolers' favorite topic: how we make poop. You are lead through a tour of the digestive system with plenty of descriptive text explaining each part of the system; the role it plays in digestion; and how it functions. Corcoran manages to present an amazing amount of information in The Quest to Digest. 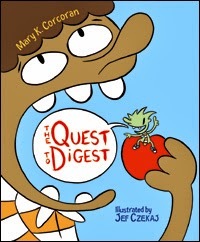 The book was a great review of the digestive system for me, yet never becomes overwhelming or dull to a young reader. 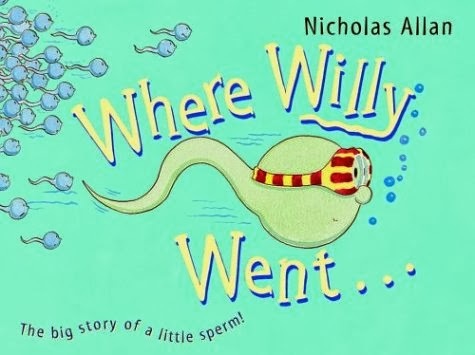 Where Willy Went is a fun book that focuses primarily on fertilization through a wonderful blend of nonfiction and fiction. All of the facts about fertilization are accurate. The book explains that sperm are created in men; that sperm need to find the egg in a woman; and that the first sperm that reaches the egg unites with the egg and starts cell division that will eventually develop into a baby. All these facts are explained through a storytelling device of Willy, the sperm, preparing for the big race. What impressed me most about Allan’s book was the perfect mix of story and basic information about reproduction. Because the book primarily focuses on the narrative of Willy, many of the details about reproduction are playfully implied rather than explained in great detail. This allows the child to lead the discussion, and the specifics of the “facts of life” can be elaborated on or overlooked depending on the child’s own curiosity or development.